Fighters from ISIS have a new base of operations just some 6 km from the residence of Syrian President Bashar Assad, after entering Yarmouk, a Palestinian refugee camp in Damascus suburbs, amid reports of assistance from the Al-Qaeda-affiliates. “Credible information from public sources indicate that a variety of armed groups are engaged in fierce fighting in areas where Yarmouk's 18,000 civilians, including a large number of children reside, placing them at extreme risk of death, serious injury, trauma and displacement,” said a statement from the UNRWA, the international agency that aids the Palestinians in the region. Islamic State (IS, formerly ISIS) stormed the camp from Hajar Aswad district, located directly to the south, where it has enjoyed a solid presence in the last few months. 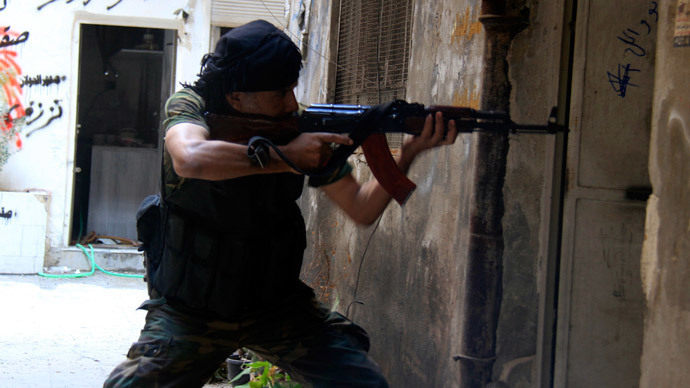 As it attempted to penetrate Yarmouk, it was met with gunfire from Palestinian jihadist organization Aknaf Beit al-Maqdis, which has recently captured 10 IS infiltrators, provoking the ire of their commanders. A crucial role in overwhelming them was reportedly played by Al-Qaeda –affiliated Nusra Front, which already had a foothold in the camp. “The Nusra Front opened the road for them in order to infiltrate the camp and several hours ago they entered Yarmouk,” Anwar Raja, the in-camp spokesman for the pro-Assad Popular Front for the Liberation of Palestine told AP. “They pushed from the Hajar Aswad area and Nusra fighters have joined them, they have pledged loyalty to Islamic State,” an unnamed local activist told Reuters through Skype. Prior to the breakout of the anti-Assad rebellion four years ago, Yarmouk, a camp in name, but a town in nature, housed as many as 500,000 Palestinians, and was considered a virtual capital outside Palestine for the diaspora. Most of its residents have long since fled. Since 2013, it has been besieged by the government, with remaining Palestinians unable to leave, as neighborhoods were devastated by artillery fire. The siege has now lasted for over 600 days, and for the last 200 Yarmouk has been without water. UNRWA, which says 95 percent of those inside are reliant on its aid, has attempted to negotiate stop-start deals with both sides to open corridors to allow humanitarian goods through, as all sides paint themselves as supporters of the Palestinian cause. A new deal was arranged last month, following a blockade that lasted since the beginning of the year, but is now likely under threat, as previous advances have led to the sides reneging on promises to allow peace corridors. With IS suffering losses elsewhere in Syria and Iraq, due to coordinated action from Kurds and Iraqi government troops, bolstered by US-led coalition airstrikes, the invasion of Yarmouk may represent a shifting of focus back to one of the primary aims – removing Bashar Assad. Or it may be simply a way of stamping authority and taking revenge for the arrests of its members, which will likely result in the executions of several senior Palestinian militants in the camp.